Polytech Double Underfolder with spike bayonet, Excellent Condition. Appears fired very little and was put away, Not sure of a round count, could not have been too many as the bolt head face is not worn at all. The Blue Finish is in Great condition, while the carrier shows no wear. Comes with 1-30rd Chinese mag with Black follower, sling and manual. The folding bayonet and stock lock up nicely. All together a Very nice gun with almost no handling marks on the wood. Comes with Polytech correct manual and sling. This is a Polytech Double Underfolder with Spike bayonet, Excellent Condition. Appears fired very little and was put away, Not sure of a round count, could not have been too many. These are hard to find and only came in a short time before the ban came into affect in 1989. The Blue Finish is in Great condition. 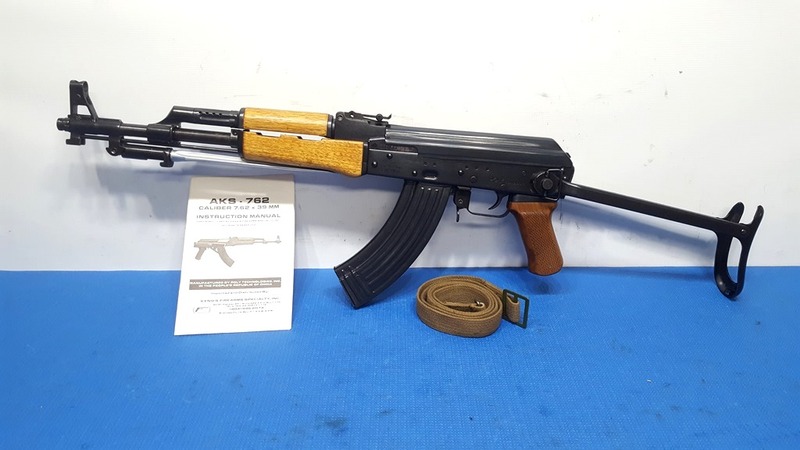 This one Comes with 1-30rd Chinese mag with Black follower, sling and manual. The folding bayonet and stock lock up nicely. This one is in great shape, i real nice find, for sure! Call Chuck anytime 305 923 6560 to order, We guarentee the desciptions on all our guns!